The Airbus A350 is a new wide-bodied aircraft, and their equivalent of the Boeing Dreamliner 787. The A350 has now made its maiden test flight of 4 hours, to and from Toulouse. The Airbus A350 is designed to be more fuel-efficient, and Airbus claims that, powered by Rolls-Royce Trent XWB engines, the A350 will use about 25% less fuel than previous generation wide-bodied aircraft. 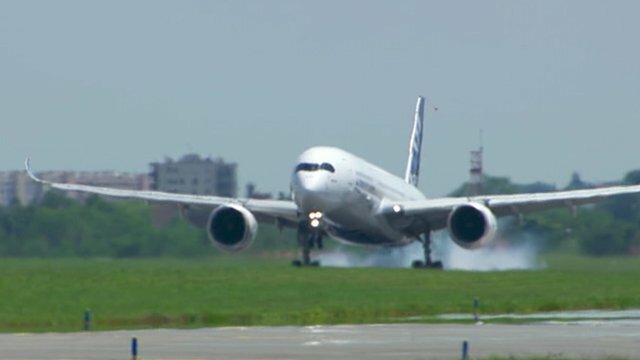 Like the Dreamliner, the A350 is made largely of advanced materials, particularly carbon composites in some 50% of the plane, and also use of titanium and advanced aluminum alloys, in order to save weight. Airbus said, about 70% of the plane’s airframe is made with “advanced materials”. The A350 is slightly larger than the 787 and there are 3 variants of it, the A350-800 XWB (extra wide body), the A350- 999 XWB and the A350-1000 XWB. They will seat between around 315 to 440, depending on layout, and will have a range of around 9,700 miles Airbus has already taken more than 600 orders for the new plane, whereas there have been 890 Dreamliner orders so far. The plane’s wings are manufactured at Broughton in Wales. Boeing’s 787 and Airbus’s forthcoming A350 are designed to make long-haul routes profitable with fewer passengers. They should thus reduce the need for connecting traffic – ie. hub airports. The newest aircraft from European planemaker Airbus has successfully completed its maiden test flight. The Airbus A350 is designed to be more fuel-efficient, and a direct competitor to US rival Boeing’s 787 Dreamliner. It is seen as vital to the future of Airbus, which competes with Boeing to supply the majority of the world’s airlines with new planes. It took off from Blagnac airstrip in the French city of Toulouse, where the A350 is assembled, on Friday morning. The plane made a four-hour trip and landed back at Toulouse shortly after 1pm. Boeing’s Dreamliner has proved popular since its first flight in 2009, despite recently being grounded by regulators over safety fears relating to its batteries. Major milestoneAirlines are being squeezed by high fuel costs and falling passenger numbers, and are looking for more fuel-efficient aircraft. Airbus claims the A350, powered by Rolls-Royce Trent XWB engines, will use about 25% less fuel than previous generation wide-bodied aircraft. Like the Dreamliner, the A350 is made largely of advanced materials, particularly carbon composites, in order to save weight. Airbus has already taken more than 600 orders for the new plane, whereas there have been 890 Dreamliner orders so far. The company hopes to start delivering the first A350s to customers by the end of 2014. Analysts say a successful test flight would be a major milestone for Airbus in the A350 project, with major aircraft manufacturing projects frequently beset by delays. 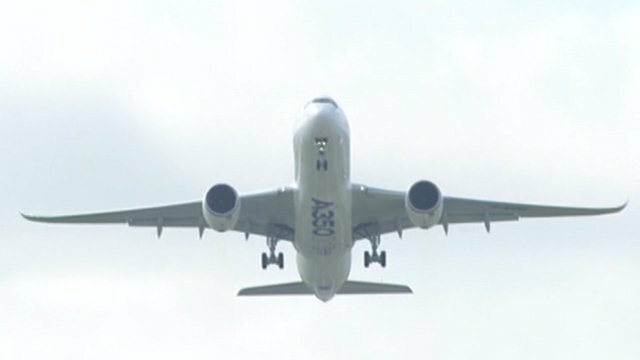 “All recent programmes before it, both by Airbus, Boeing and others, have had reasonably horrendous technical problems and delays,” said Nick Cunningham, an aviation analyst at the London-based Agency Partners, speaking to French agency AFP. The plane’s wings were designed at an Airbus facility in Filton near Bristol, and are manufactured at Broughton in Wales. Airbus plans on building three different models of the A350 XWB. First up is the A350-900, which directly takes on Boeing’s 777-200ER, and which is meant to replace Airbus’ own A330-300. The A350-900 is expected to seat 314 passengers in a three-class layout, and use Rolls-Royce Trent XWB engines generating 84,000 pounds of thrust each. The plane will have a range of 8,100 nautical miles (9,300 miles or so). The Airbus A350 XWB is a family of long-range, two-engined wide-body jet airliners under development by European aircraft manufacturer Airbus. The A350 is the first Airbus with both fuselage and wing structures made primarily ofcarbon fibre-reinforced polymer. It will carry 250 to 350 passengers in a typical three-class seating layout, depending on variant. Airbus also believes its proposed 10-abreast high density seating arrangement for the A350 XWB would offer unparalleled operating efficiency for long-haul aircraft; furthermore, with 440-550 maximum seating depending upon the version of the aircraft, this is a practical evolution for the A350. 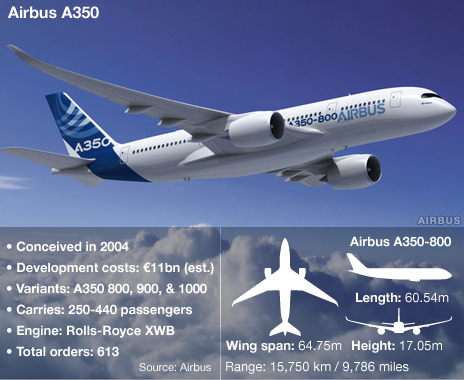 The A350 was originally conceived in 2004 as a largely new design, but with a fuselage based on the A330. This was rejected by some prospective customers. In 2006, Airbus redesigned the aircraft and renamed it the A350 XWB (for extra wide body). Airbus stated that it will be more fuel-efficient and have operating costs up to 8% lower than the Boeing 787. The launch customer for the A350 is Qatar Airways, which ordered 80 aircraft across the three variants. Development costs are projected to be €12 billion (US$15 billion or £10 billion). The airliner is scheduled to enter airline service in mid-2014. As of May 2013, Airbus has received 613 aircraft orders from 33 different customers around the globe. The prototype A350 first flew on 14 June 2013 at Toulouse-Blagnac Airport, France. The A350-900 is the first A350 model and seats 314 passengers in a 3-class cabin 9-abreast layout. It has a standard design range target of 15,000 km (8,100 nmi). Airbus says that the A350-900 will have a decrease of 16% MWE (Manufacturer’s empty weight) per seat, a 30% decrease in block fuel per seat and 25% better cash operating cost than the Boeing 777-200ER. Posted: Saturday, June 15th, 2013. Filed in General News, Recent News.